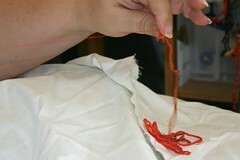 … and the completed Orange fiber. Prayer: Father, thank you for her strength, caring, courage, and grace. Thank you for the supportive people who surround her, and for all the things in her life that help her now. 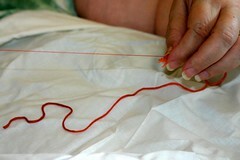 Now it’s time to make up the fibers for stitching the piece. I’ll start with the dark red. 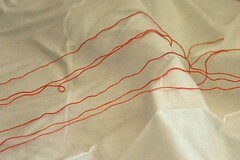 I’m stitching with silk, and on 18 pt canvas I want 4 strands per fiber to cover the canvas. So I can pick at most 4 threads to go into my fiber. 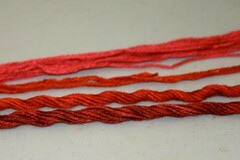 Here I’ve chosen the really vibrant red solid, plus the three darkest reds variegateds from my raw thread palette. 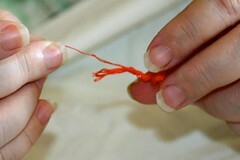 Now we need to separate our threads into individual strands. 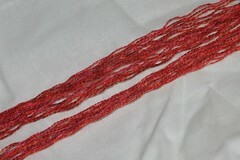 First tease the end of the thread to reveal the strands. 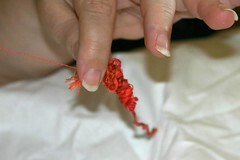 Next, grab one strand and pull. … but firmly enough that the remaining strands stay behind. The rest of the thread will bunch up behind the fingers. This is OK. 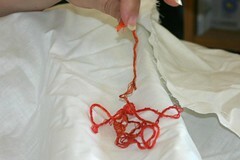 If the strand being pulled out gets caught up, pull gently on the tail of the thread until the strand releases. 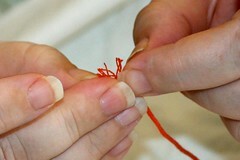 When the single strand has come totally out, the thread bunch will release. Keep doing this until you have all the strands you need. 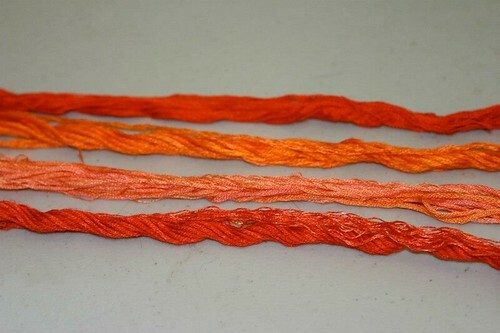 And here is the red fiber, combining a rich red shade with subtly different shades, which will provide a nice natural visual texture to the piece. Prayer: Father, help her to separate what she needs, what will help her and those she cares for, and blend something beautiful and functional. Prayer A Powerful Weapon, a photo by abcdz2000 on Flickr. Do you take thinking for granted? I praise God that He made us intelligent, curious, creative. That we explore, innovate, explain. That we design, build, embellish. That He made us in His image. The classic epic on faith. 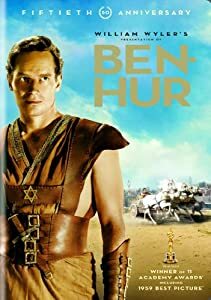 Amazon.com: Ben-Hur: 50th Anniversary Edition: Movies & TV. This is one of my all-time favourite movies. I watch it at least twice a year – at Easter and Christmas. And it amazes me how many Christians I’ve met who have never seen it. 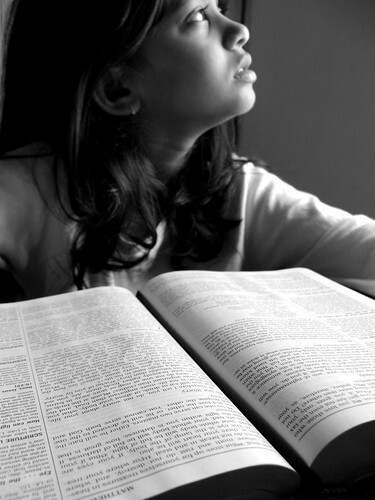 I clung to its message even when I was farthest from being a Christian myself. I’ve heard that people say “It’s called ‘Ben-Hur: A Story of the Christ’ and it isn’t about Christ at all.” I can’t understand that. It’s about God’s will working in the world, about turning the other cheek, about the incredible force of Our Lord when He turned His attention on a man. It’s about faith. 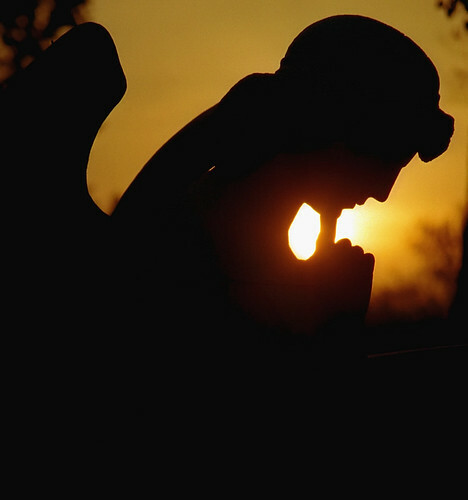 Cincinnati – Spring Grove Cemetery & Arboretum “Angel in Contemplation”, a photo by David Paul Ohmer on Flickr. Sometimes I feel like I just can’t possibly make my dreams come true. I just don’t have it in me, I think. But God wants us to believe, to KNOW, that with Him there IS a way. This is a great blog post including guidelines and encouragement for those who want to help others in crisis. 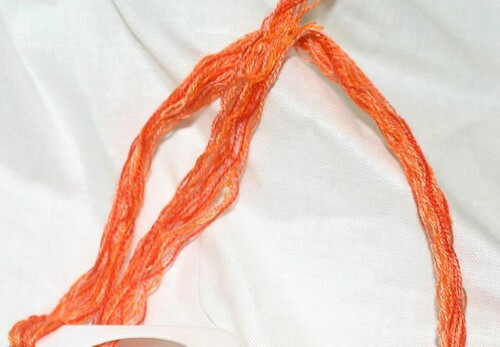 One downside of variegated threads is that the way the colors blend means that vibrant colors can’t be preserved; everything gets a bit diluted. 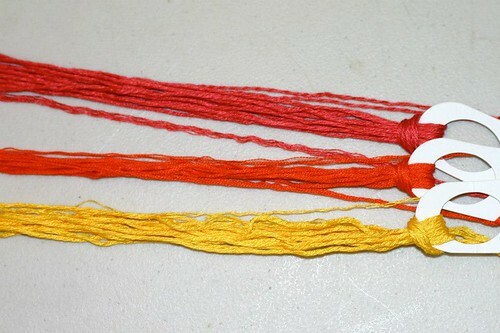 To offset this I picked some vibrant solids in the three primary colors of the tulips. Prayer: Father, please comfort her with beauty and vibrant life in the midst of the muddles of caregiving.